It’s no secret that I love unusual names. Having grown up sharing my name with thousands of girls my age, I longed to be Hepzibah. Or Elodie. And yet more popular picks can make for great choices, too. Friends of ours just called their darling daughter Emma, and it got me thinking. So here are Ten Good Reasons to call your baby Ethan or Emma, Liam or Jack. 10. Popular names tend to be great names with universal appeal. 9. They’re easy to spell. Unless you decide to name your daughter Emmalie, one advantage of a common name is rarely having to correct others. Plenty of us wear cumbersome last names. If you’re constantly spelling Niedalkowski, maybe having a first name like Ava is a good idea. And if you’re crossing cultures, sticking with a simple pick might be wise, too. 8. Repetition is rarely necessary. Try this exercise. Call your daughter Clio. Introduce her to someone new. Hear new person say, “Hi, Chloe.” Politely say, “Actually, she’s Clio.” Repeat a bajillion times. This probably wouldn’t happen with Charlotte or Mason – we expect to meet children with those names. Yes, everyone will eventually remember that your son is called Eben, not Evan or Ethan or Benjamin. But be prepared to smile lots until that happens. 7. Even a #1 name is less popular than it ever was in prior generations. There is not a single girl called Harper enrolled at my daughter’s elementary school. There are no boys named Noah. In 1908, over 5% of boys were John and more than 5% of girls were Mary. In 1978, nearly 4% of boys were named Michael, and over 3.5% of girls were called Jennifer. Today, a mere 1% of all children born each year receive the most popular name, and the percentage will probably continue to drop. 6. Some of the most popular names might still sound novel. As it happens, Scarlett is rising fast. But today’s parents certainly didn’t grow up with a Scarlett, and that might be all that matters. 5. Some of the most popular names might be truly enduring. If you love the classics, why not use Elizabeth and James for your children? Sure, they’ll know others with their name. But they could hop in a time machine and probably meet another James or Elizabeth throughout much of history. It’s hard to argue that Grace or Henry is trendy, even if they’ve recently been popular. 4. Some trendy names endure. Madison will, inevitably, fade from use, and all of those Jaydens? Some day their names will scream thirty-something and, eventually, octogenarian. But other names age gracefully. Amanda and Martin are far from their heyday, but remain perfectly reasonable – even sensible – picks for a child. 3. Some kids embrace being one of many. I once met a Kate who grew up with a best friend called Katie. They loved having the same name, even mashing it together to call themselves the Katie-Kates. There must be similar stories on every playground in America. Just because I hated growing up with a Top Ten name doesn’t mean your child would mind being Jack T.
2. There are no guarantees that an uncommon name will stay that way! The year is 2001. You choose the stunningly unusual Aria for your daughter. Today’s fashionable, but obscure choice – think Elora, Antonella, or Wren – could be just one celebrity birth announcement away from the Top 100. 1. Your favorite name might have meaning. Maybe you’ve always wanted to name your daughter Emma, after your favorite book. Or maybe William was your beloved grandfather’s name. If that’s the case, their popularity doesn’t matter one bit. The name will always feel just right. What do you think? Would – or did – a name’s ranking in the Top Ten stop you from using it? I’m a Katie (short for Katherine), my best friend when I was young was also a Katie. My worst enemy was a Kate. I work with a Katy, Kate, Katelyn and Kathryn. I’ve never been the only Katie, ever. I feel your pain! My current BFF is named Elisa. My middle name is Elise. Coincidence? I think not! Hi. I just wanted to say that I love your choice of names and that coincidence is the craziest thing on the planet! I hope that all is wonderful with your family and that Master Dash goes on to have at least as much fun in this life as I am having. My husband and I chose the name Isabella for our first born and sometimes I regret it, but at the time, it’s what I wanted and needed. We never looked at name lists or popularity charts, we just talked in the evenings before we would fall asleep about names we liked. Neither of us knew any people named Isabella to taint the name for us, and we liked that everyone can pronounce it and that it’s a traditional spelling. At La Leche League I met another mom with a daughter named Ysabella and I thought that was pretty also. I’ve met some Izzy’s also. We call her Bella and it’s fitting for her. She’s a happy-go-lucky girl who makes friends easily and is generally pleasant to be around. We are expecting our fourth now. I am unsure of the gender (only 13 weeks) but if it’s a girl I loved the name Elizabeth with the nickname Betsy. I think that it would be cute to have two girls with longer more formal (and popular) names who have the nicknames Bella and Betsy. When growing up I LOVED super unique names and I thought that people who chose common names were boring and old. I’m the ripe old age of 28 now and I can appreciate the reasons you listed to having a common name myself. One of my best friends was also Amy growing up and teachers called us “A squared” and we thought that was cool. When I read people’s birth announcements on FB or church bulletins, etc, I always think about why they chose that name. I know some people that had really unique names are drawn to more common names. Congratulations on baby #4! And Bella and Betsy appeal to me, too – I’m a sucker for alliteration. I love the nicknames Bella and Betsy as well, and both full names are beautiful. But aren’t they essentially the same name? I think that Isabella is a Spanish or Italian variant of Elizabeth, but you may already know this. It’s a bit like having a pair of sons named John and Gianni. Naming the girls Elizabeth and Isabella (Bella and Betsy) is no different than how families historically named their daughters. Look back through history and you see families with many variations of essentially the same name, ie Mary, Margaret, Mamie, Marilyn, Maisie, Polly, Molly, etc.. Depends on how much I love the name. Classics like Elizabeth or James that might be in the top 10 I will use no matter because as you’ve said, they’ve always been popular. If Sarai (not likely but let’s go with it) became super popular I might hesitate, not sure, just because now it is a unique choice so that part of naming my child that is ruined once it becomes super popular. Though for the most part, I don’t care about popularity much. My name was the #1 name the year I was born, and though I hated being one of many, my name was “tease proof” because there were plenty of alpha-girls who shared my name, and it is politically unwise to tease an alpha-girl. When I was growing up in the 80’s/90’s, I hated that I was the only Joanna in my school. (Actually, the year I graduated there was another one in Grade 8.) Even now when I meet another one, we’re both shocked, cuz there’s not many of us out there! Fast forward 30 years and my kids are named London (3year old boy) and Teaghan (18month old girl). We picked unusual names because their dad’s last name is Brown and I didn’t want my son to be one of two or three Ethan Browns in his class. (LOL) Their dad picked London because he wanted something that honoured his British heritage. And I picked Teaghan because… well, honestly I just went through the name book until I found something that was unusual, meant something pretty and we both agreed on. The year London was born, there were 6 other Aiden/Aidan/Aidyn’s born (both boys and girls) that I knew of. And this year there is a veritable explosion of Isabella/Isabel/Isabelles. But, going back to my school years, I always envied the 3 Heathers in my class. I guess I’ve sentenced my kids to being the only one of their name in their schools too. I hope they don’t hate me too much as they grow up. What Im hoping is that they appreciate their unique monikers and grow to fit them. Very interesting. My daughter is in kindergarten and there is not one Jacob or Emily in her class. We only know 2 Emily’s one is my age and the other is my daughters age. I wanted to name her Alyssa but didn’t want her to have a bunch of other girls with her name. I could have done it though. I have never met an Alyssa. Now my son has a popular name. There is not one in my daughters class, but in the other kindergarten class there is. 1 Tim 4:12, I like your verse! Calliope will be NotD on April 8. I actually went to school with a Greek Kalliope, nn Kali. I can’t remember her sister’s name … I’ll have to see if I can find my yearbook. Kylie, I’m dying to know what you plan to call Andrew? My mother wanted to name my brother Andrew. (But after three girls, my dad insisted on a junior.) She would’ve called him Drew – just like every other Andrew born in 1984! What an awesome post! It gives me great peace of mind, since we’re dead set on the name Andrew for our first boy (based on reason #1 – favorite book). We intend to use a unique nickname, but it appeals to me that he has options when he gets older – he can go by Andrew, Drew, Andy, whatever strikes his fancy and fits in with his personality. Thanks for the great post! I really like the name Kylie. What was your experience growing up with the name Kylie? Wow, what an interesting post! Hi, I’m a bit of a lurker, and I really adore your site. These are excellent, really thought out reasons to use popular names! Back before Chloe skyrocketed into the top 20, my best friend was christened that. To this day, people call her Clio all the time. Drives her nuts! Keep up the good work, ’cause I really enjoyed this list! I’d like to suggest Calliope for a future NotD. Lyndsay, Congratulations on the birth of little Dashiell David! My oldest son was named after his dad’s grandfather, Valente. Not only was it far from my ideal name, I feared people would call him Val. Thankfully it never happened! When my youngest came along nine years later, even though I still liked Benjamin, I KNEW since the early days of my pregnancy that he was Andrew. Both dad and I liked the name and I have always thought of it as classic and timeless. There was a soccer game once with Andre, Andres, Anders, and Andrew split up between both teams – hearing the parents and family and coaches screaming out the names was hilarious! I am happy that we went with Andrew – easy to remember, easy to spell, and easy to pronounce. Great post! I especially appreciate #6 and #7! I love the names Jennifer and Jessica, EVERYONE who hears it just gags! They complain how popular the name is, and how any future babies named these will be one of like 12 in their class, just like how it was growing up…I have to remind them that any Jennifer and Jessica of now would almost assuredly be the only one in their class. These names are pretty, they are well-known, and now almost novel. You go to any random name board you hear “I don’t want my baby to be unique and not one of many in their class, thats why I’m naming her Emma/Madison/Addison/etc, and all I can think is that those are the most popular names right now, something classic or old-fashioned will be a lot more unique than those! Number 7 is a good one to remember, I also love Emma, and I love Emily as a middle name (Beatrix Emily to me is full of rich history! ), but you say you like those names on a name board, everyone screams “Too popular!” or “Too overused!”. I don’t really think so though. Not that many people are using them! 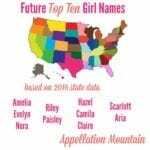 But that said, most of my own favorite names are not on the top 1000 list, and most of the rest are not in the top 500…though if Erik was dead-set for it, I would happily use Elizabeth, Sophie, Emma, Ella, Hannah, Abigail, Jacob, William, Andrew, Alexander, David, James, Nathan, Samuel, or Benjamin! Lyndsay Jenness-Dashiell David is LOVELY! photoquilty-I adore David, and I actually think it makes a great brother to Ethan! I only know one Ethan (about 2 now), and actually know 2 little boys named David! (one about 2 and one about 3). And they are David, not Davey, I think just David is soo adorable! Funny, Photoquilty, David is one of my favorite names. I can’t say why – I’ve always loved David, even when every other name on my list was far less common. JNE, I still think Imogen Lily sounds perfect. Emmy Jo, that’s a nice point. If you’re choosing Addison because it sounds different to you, that’s fine. But you should know going in that your daughter might be one in a crowd – and she might not like it. (Or hey, she might have a best friend called Madison and get a kick out of the rhyming thing.) Either way, it is best to KNOW that you’re choosing a common name, rather than floating along thinking that Hailey is the most creative pick ever. Glad everyone enjoyed reading this – I’m going to unstick it from the top spot so the new stuff appears at the top now. Case in point: I LOVE LOVE LOVE the name David, but immediately said “no” when my husband suggested it when I was pregnant (with Ethan). It was too familiar, not at all creative. Of course I wasn’t aware of the name rankings when I picked Ethan (he was number 4 the year he was born). David was everywhere – he ranged from my grandfather’s peers to my own. I couldn’t imagine giving this common name to my little boy. So we named him Ethan, which was a name of several of my peers, but not a name I’d heard recently. Then I found the SSA list. Oh well. What could I do? However, Ethan’s almost 2 1/2 and he has no friends named Ethan. As a matter of fact, in the three states we’ve lived in since he was born, we have met only two other Ethans of his generation. One was in utero 😉 and the other was just a touch younger than my Ethan. However, we know a Charles, a Charlie (boy) and a Charlie (girl, well she’s Charlotte, but will never be called that). We know a Sarah and a Sara. Ethan and his little friend Leo have the same middle name, James. We know one Cayden and his brother Quintyn. We have a friend Madison and her sister Madeline (yes, I know). There are a Christopher, a Joseph, and a Rylan in his group of friends. There’s also a Preston and a Parker. I know three Benjamins born in the last 6 years, two Emmas, and one Zoe. My point is that no matter what all the data show us, no matter how many times you see the same three names suggested on Y!A, the key to knowing how popular (or not) a name might be is to look around at all the little ones you know. I can’t choose Charles, clearly, nor Benjamin, Sara, or Emma. But Ethan was clearly not the popular choice, and there is room enough for David! Congratulations, Lyndsay. Dashiell David is dashing! Excellent post, Abby! There are sometimes VERY good reasons for using a top ten name. I personally would consider using William, Ethan, Elizabeth, or Abigail if my husband were ever to suggest them. I’ve often thought about your point #7. I hear people say things like, “But there will be four Jacobs in every class!” Thinking about it mathematically, if only 1% of all babies of a certain gender are given the top name for that gender, that translates to only one out of every 200 babies (when you include both genders). If only one out of every 200 babies born the same year as your child is named Jacob, it is statistically very likely that he WILL be the only Jacob in his class, especially considering most lower elementary school classes are limited to 20 students. And there are always weird flukes — last year, there were two boys named Cade in the first grade class next door, and Cade isn’t even in the top 200. The only point of yours that I disagree with is #6 (“Some of the most popular names might still sound novel”). I think it’s very shortsighted for parents who don’t want their child to be another Jennifer or Jessica to choose a name that is this generation’s equivalent. It’s fine to name your kid Addison or Isabella, PROVIDED YOU REALIZE that in 30 years, Addison and Isabella are going to have the same feel that Jennifer and Jessica do now. Parents who choose a trendy name for its novelty seem as if they are not thinking things through — does it not occur to them that Jennifer sounded novel to new parents of the 1980’s? Verity – fun post. I’ll admit to being swayed away from names due to popularity. Back when we first tried to get pregnant (nearly 8 years before it actually happened for us), we had talked about names and Isobel and Lily were tops for us then… they weren’t all that popular at the time (or didn’t seem to be). Fast forward 8 years or so and we knew a number of children with those names, as well as hearing them when we were ‘out and about’ and that’s really what put us off. 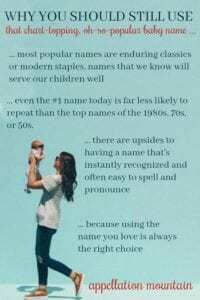 And while all the reasons mentioned are absolutely valid, I would still have the same gut feeling to move toward a more unique name. That said, I also agree with the many comments that there is no way to know if your new baby will love being a one of one or prefer blending in… I frequently have moments (especially when spelling, repeating, explaining her name) when I hope she won’t curse me for saddling her with her name. But I’m sure the concern would be valid with Emma, Emily, or Olivia…. or Lily or Isobel, just for different reasons. And even though we went through, literally, tens of thousands of names (well I did), to find our daughter’s name, it isn’t that far from those first ones… an I-starting first name from the British Isles and Lily in the middle… Truthfully, she could have been Lily, even with the popularity of the name and variants, had we been able to agree on a “full” name that gave us that nickname. Really, it seems just important to consider the implications of using a popular name (the possibility of being Emma S.) and those of using a unique name. And then cross your fingers that your little one doesn’t hate it. Thanks again Verity! Lots of fun! There were four Karens in my fourth grade class of 28, including me. So I very much know the pains of having a popular name. Except, it was the name my parents both liked (as opposed to Hezekiah, which only my father liked!) and as I’ve gotten older and hang out less with people all born in the same year, it’s much less burdensome. I do have to spell my name, though! Caryn, Caren, Karyn – I’ve seen people default to all three! Of course, I think Karen is the “correct” one, hee! This is a great, thought-provoking post. It makes the much-needed point that just because a name is popular, it shouldn’t immediately be dismissed. Names are popular for a reason! I loved this post. I recently mentioned in another comment on this site that I am getting more and more bold in trying to forget about a name’s popularity and just go with the ones that I like. I know a lot of Sarahs, but I still think the name is beautiful, no matter how many times I hear it. Same with Amanda and Emily. Incidentally, I grew up with an Amy N. and an Amy C. in my class all the way through fifth grade. They had a tight bond, and frankly, I was jealous of their short, trendy name. My name was unwieldy and bulky in comparison, and because of the variant spelling, looked masculine amid all the names of the late 70s that ended in “-y”. Some of us just wanted to fit in; others just want to stand out. It’s impossible to determine which will be the desire of my future child, so I figure I’ll just quit worrying about popularity of a name and just choose the one I think is the best fit. Congrats, Lyndsay! I love Dashiell. As the mother of James Kenneth, these are basically all the reasons I kept soothing myself with. I felt comfortable with a strong, classic name, but as a Kayt/Kate in school, I hated being one a kazillion Kates and Katies. It didn’t help that my parents and sister all have familiar but unusual names (Brett, Margo, and Amelia). Amelia’s going through the thing where her name is getting pretty trendy. She’s never had more than one other Amelia in her whole school, but she works at a preschool where there are two Amelias and an Emilia out of fifty kids! I remind myself that while James will probably run into several other James throughout life, he’ll probably be the only one in his class. He might get mixed up with the three Jaydons, though! 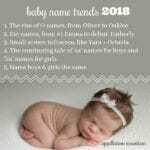 4. the names getting mistaken as common names (my 1st daughter has been called Olivia and Ophelia, LOL, and my 2nd has been called Zoe repeatedly). Depending on the situation, sometimes I don’t correct them, LOL! This is actually very interesting. I don’t know how many times I’ve dismissed a name on the basis of how popular it is, despite the fact I know perhaps only one or two people who carry it. I think, however, it depends on where you live; my town tends to be quite conservative in its naming and so, when I help out at the creche at my local church, there always seems to be a Sam and a Joshua, if not several! Saying that, though, I came across a little girl named Evangeline on Monday- it was quite the event! Emma, there’s something in that! There’s a huge difference between names that are popular among the general population and names that are popular among people we know. I’ve said the flip side of this when defending unusual names – live in a big enough city, and anything is “normal.” Until you up and move to a small town somewhere, at which point Caradoc and Briar are going to stand out a mile! 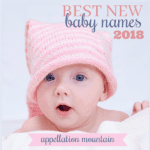 But if I think about popular names, what really matters is names that are popular with the people you know – so regardless of where you live, think about your immediate circle of friends, neighbors and colleagues. 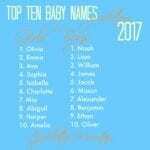 By that standard, the most popular boys’ names in my world are Max, William, James, Zachary and Theodore, with Charles (nn Charlie) taking the #1 spot. For girls, Emma is #1, and there isn’t a clear #2, though Isabella and Sophie/Sophia are probably up there, too. Can someone please tell me if I am crazy for sort of loving Evangeline? I don’t think so – I have good friends who are planning to use Evangeline for their daughter, due in early 2011. If you look at all the Eve names: Eva, Evelyn, etc., there’s no reason to think Evangeline wouldn’t fit in. It’s a Louisiana name. We have a parish named Evangeline Parish and it’s French. I’ve heard of several down here, but I’m not familiar of their use in the north. Only if I’m crazy. 😉 DD is Evangeline. She just turned 3. Congrats Lyndsay! Dashiell David Rowe is really lovely! A name’s ranking’s didn’t stop me from using it, but did make me pause before usung it. And funnily enough it was the boys name that made me do it. Leo was quite unfashionable almost 23 years ago but the thought of not honoring my wonerful Uncle Leo (long gone by the time mine was born) was just too awful to tnk about, so Leo he became. I must admit when he was little, I did repeat it a fair bit. Simon, they got; Leo got Lee? Leon? Leroy? And I must have said no, Leo about a thousand times a day for 5 or 6 years. But people did eventually get it. And it makes me laugh to see a god number of people singing the praises of Leo today. The only popular names I would use, if he’d let me are Elisabeth, which would give her respelling problems forever and Sophie, which seems to give people fits thinking it’s Sophia (which I hate). On the boys side, James & William are the two I’d happily use, again, if I was allowed to. There are far too many of them already for his comfort. I didn’t mind sharing my name too much with my peers but was horrified at 11 to find I had a teacher with the same name. She was OLD! 🙂 I still wish my mother had been able to name me Alice. I very much feel like one but think I got a decent deal. I loved this post, Verity. While family concerns and older names are my first loves, I find nothing wrong with the classics. Suddenly popular (aka trendy) do bother me a bit, the invented, wrong gendered feeling ones (I’m talking about YOU, Madison), just enough to not only not want to use them myself but to go ‘eww’ in my head when I run across one. (I’d never, ever say anything aloud!) But the classics? There’s a reason they’re called classics. They’re enduringly appealing. Thanks, Lola! It is interesting to hear that Leo once got the same reception. Everyone seems to be wild ’bout Leo these days! But how could they ever confuse him for Leroy! Yikes! You make some really good points here. #7, I think this is a really important one. When you look at the number/percent of actual babies born with popular names, it makes it seem not so bad. When I was considering the name James, I looked at it’s percentage in my state today vs. when I was born and realized that the number is far less now than it was then, and I can only think of 1 James from all my years in school! Not so bad! I think I would use a common name if it were a classic, but not one that’s just trendy, like Aidan. My two absolute favorite girls names used to be Sophia and Olivia. I still love them, and even though they’re so popular, I never get tired of them. I wouldn’t be able to bring myself to use them while they’re this popular though. In other news, I had my baby on Friday! His name is Dashiell David Rowe!